Combine fashion and function with the stylish Paws N Claws Couture dog collar. The colorful brown plaid design, printed on a beige background, gives your doggie a classy look. It’s made from strong, nylon webbing with a secure and easy on/off plastic buckle, and a sturdy D-ring that perfectly matches the available leashes. Lets your dog express his personality with a couture collar perfect for both male and female. Features a lively and stylish plaid pattern in shades of brown and beige. Made from a strong, heavy nylon webbing with a secure and easy-snap buckle. Comes in a variety of sizes, so you can find the perfect fit for your pal. Can be matched with the Paws N Claws Couture dog leash to make it a complete and chic set. Check out the matching Paws N Claws Couture leashes to complete the look. All favorite pups make a mess sometimes... if their new collar happens to get dirty, a good scrub with cold water & pre-wash stain remover should do the trick. Hand wash your collars in cold water. Once hand washed clean, lay them flat on a towel to dry. Please do not use bleach & be sure to air-dry the collar. Note: some slight stretching may occur after washing so adjust as necessary afterwards. Our collars are durable & made to last. However, be sure to check your dog and cats collar for signs of wear & replace when necessary. 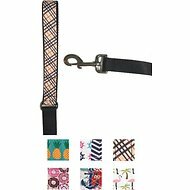 I ordered this collar for my morkie, thinking it was adorable and looks like the Burberry print and a pretty good deal for a collar. It looks as pictured, but a cheap quality. She wore it for about a week and a half, and then when I took her out for a walk, the metal piece for a leash to attach to snapped off and collar broke in half and my dog got loose. Luckily I caught her (after about 20 minutes of running around) and she didn't get lost or hurt, but needless to say, this collar isn't up to the standard of anything else I've gotten through Chewy. Emma loves her new collar! The tan and red plaid with the black webbed collar back is stylish and comfortable! Very cute and high quality product! I would also recommend purchasing the matching leash. I love the designer look on my English Bulldog and it’s as good as new for the last 2mos so that’s a win for us!